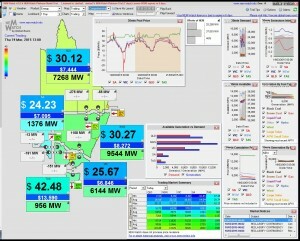 As you’d be coming to understand, the NEM-Watch application is a very powerful tool for visually representing the complexities of the National Electricity Market. 1) Save Snapshot – this simple tool allows you to save a screenshot of your NEM-Watch application at the click of a button. 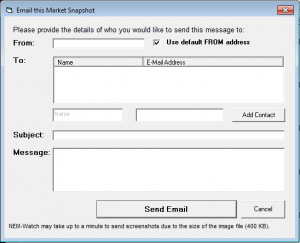 2) Email Snapshot – clicking on the mail icon in the top left hand corner of NEM-Watch will allow you to send a screenshot to your employees, clients or anyone else that you are trying to explain the NEM to. 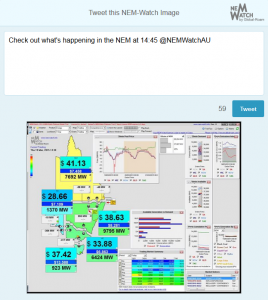 3) Tweet Snapshot – starting with NEM-Watch v10 you can now tweet a snapshot to your followers directly from the application.